Anyone can grab a recipe off the internet, make a list, and go to the store to buy everything needed for the dish. But no one cooks like that every night. 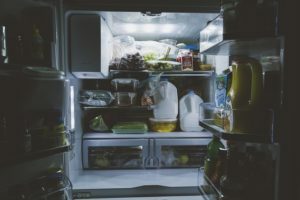 More often than not, we peer expectantly into the fridge and hope for a miracle dish to form in front of our eyes with the odds and ends we’ve collected. We firmly believe that good, even beautiful, meals can grow from whatever’s hanging around, and save you from too many trips to the grocery store. Chef Mike grew up in a house where “loavers” – his father’s term for left-overs – were on the menu many nights. In this class, Mike will give you four enduring techniques for creating a satisfying meal from random fridge ingredients. Omelet Challenge: Mike will teach you two omelet techniques: French and American Diner. Students will come up with their own omelet designs in the class with a mystery pantry of ingredients to test their skills.